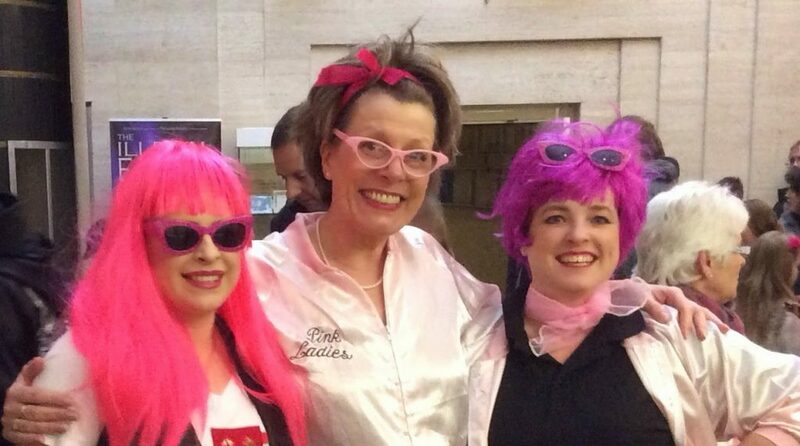 Just got in from a fab night out with the Pink Ladies! I got lucky at the NEC! and she lent me her wonderful skirt and petticoats. 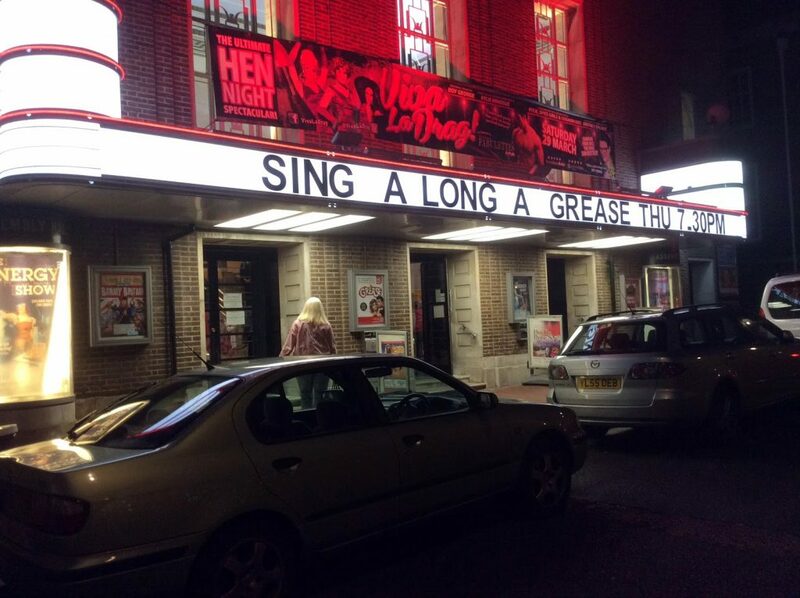 Been singing and bopping along at the Assembly Halls in Tunbridge Wells. It was hilarious! And so good, just to switch off and have a crack. I had forgotten how kookie Grease was! There was something really wholesome about being in a hall almost entirely filled with women, of all ages, all singing, dancing and doing the hand jive! I couldn’t keep up! But boy did we laugh! Can you imagine your partner walking like John Travolta did in that film?? You’d never leave the house with him!! But it was good, harmless fun. Reminded me a little of a panto or a modern day music hall. It was good to get those pink winkle-pickers off when I got home, too! What a crippling fashion statement they were, too! We were saying over dinner before the show, that 30 years ago, Jan and I would NEVER have had the nerve to walk into a restaurant dressed up like that. At least not sober! Now I want to go the the Sound of Music Sing-along! Just fancy myself as a Maria…. That looks like a lot of fun! 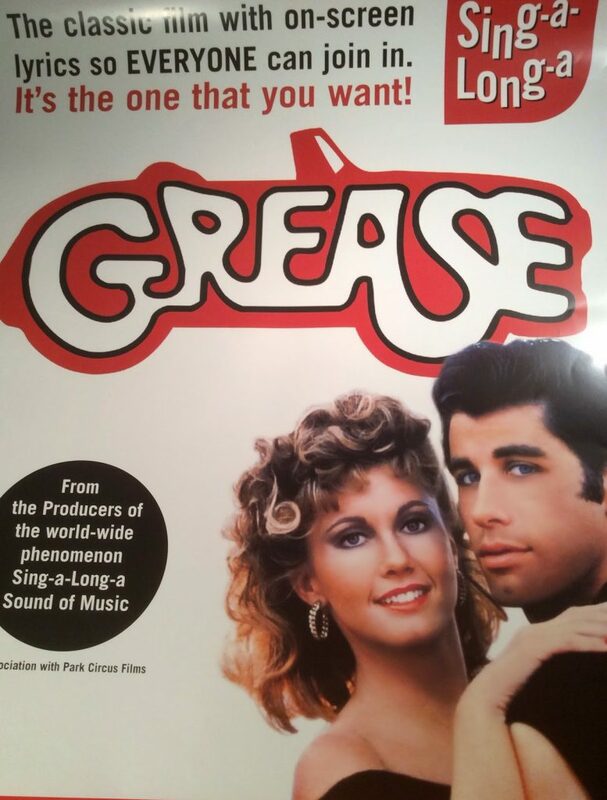 You could change the lyrics a little – "Look at me, I'm the stamp lady", "Hopelessly devoted to Glue", "Born to Hand Stamp" and "Greased Brayering" for example! If I could spell I would be dangerous – let's try again ! I love the sing along …… Events . I went to sing along the sound of music a few years ago and it was a blast but then went to sing along rocky horror and that was a night to remember and then some . Not seen any running locally for a while but your blog has compelled me to go look as it is a very good friends big birthday this year and she would love it (she has her own nuns outfit from a very dodgy cheese and wine fund raiser she did a few years ago ). How fantastic is this, I love the concept and of course your outfits. 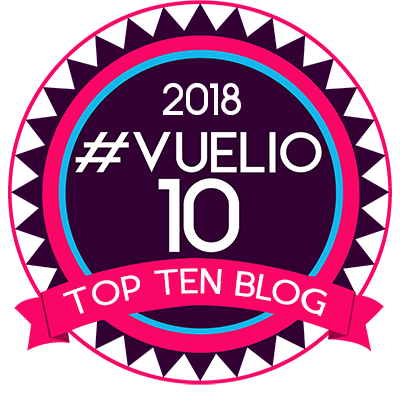 Way to go, I am just smiling enjoying this on the blog and thinking, Beauty School Dropout. Thanks what a blast! Looks like you had a scream of a time ! You all look great, nice to let your hair down and have fun! It's so good to see you letting your hair down! It looked like the best of fun too! I am 16 going on to 17 (49ish)… Just practicing! You all look fabulous Barbara, great evening had by all. 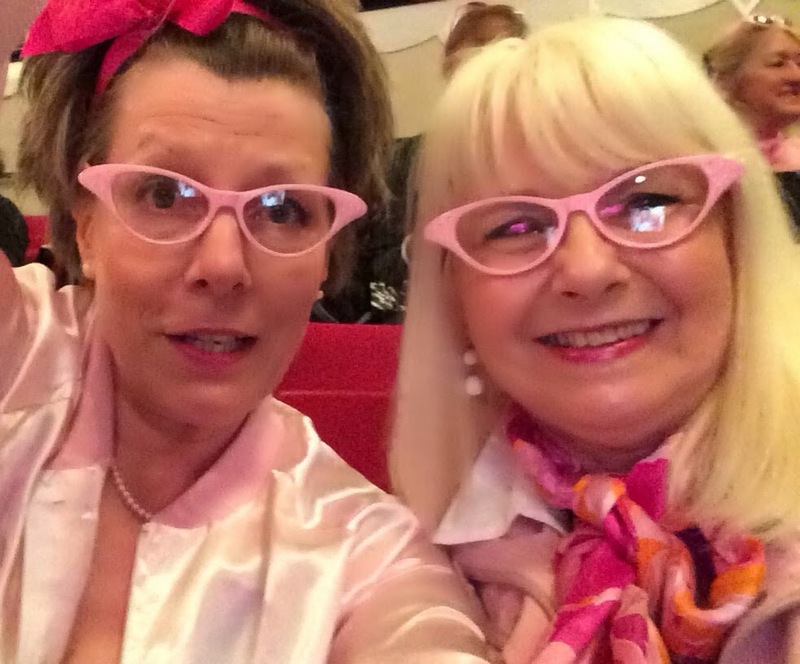 You look so good in those specs, Grease is a great film and definitely one to sing along to lol! I know when Mama Mia came out everyone was dancing and singing along with it at the pictures, nobody needed any words lol! What a hoot you all must have had! Glad to see that you are finding some me time and letting your hair down. That looks like fun to me. You seem to have enjoyed yourself a lot, and you all look stunning in your black and pink clothes. My word, you are so slim in your "leather" legging!!!! Thanks for sharing. Ooo what a fun night out u must have had wish i could do something like that!!! glad u had a great time u all looked fab. What fun! It's good for the soul to get out and sing! You have to do the Sound of Music too! Looks like a fabulous night out. It is always good to do things like this every now and again. Love dressing up for night out. It all adds to the night!! 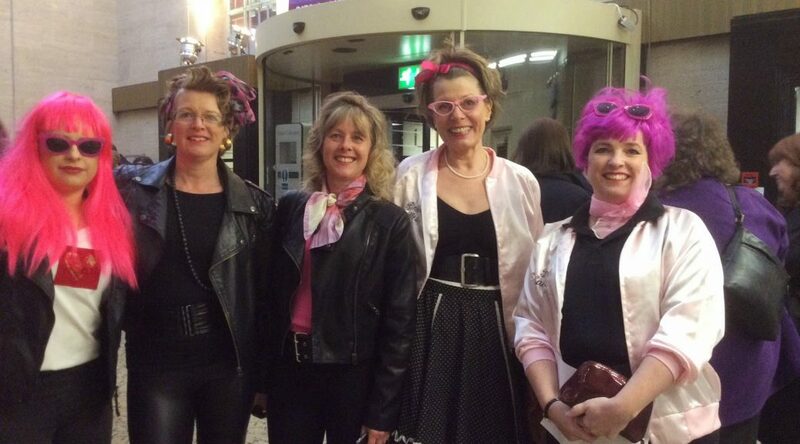 So glad you had a good night and you pink ladies all looked terrific. Would love to see that musical if ever it came up this way. Sounds great fun I will google it later! Glad you had a fab time, somehow I can't imagine you dressed up as a novice nun!!! 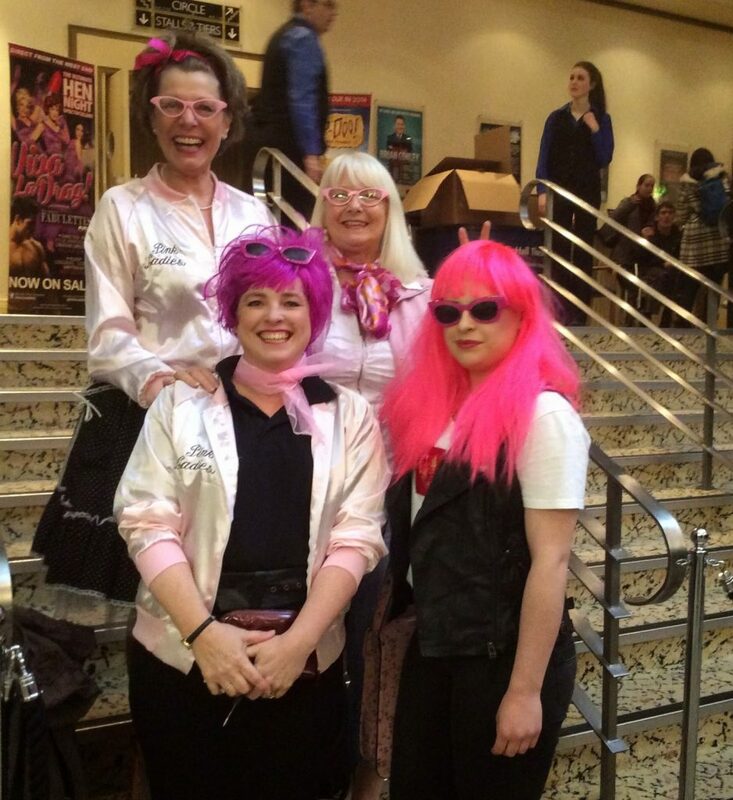 You made a great pink lady! When you work hard, you are entitled to play hard too, Barb. Looks like you had a great night! Love this musical. Did a Sound of Music sing-a-long a few years ago and it was such good fun. Hi Barbara. I love the pics! So glad that you all had a great time. I agree that as we get older we don't worry about what others think of how we look. 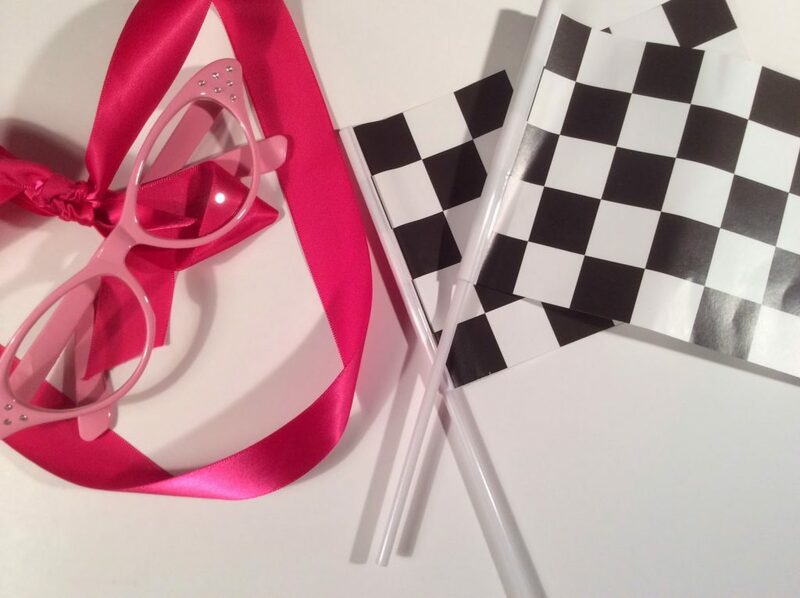 We know that having fun is much more important : ) I hate fancy dress parties usually but would love to do the whole Rocky Horror or Grease Sing a long. Have a good weekend. Take care. 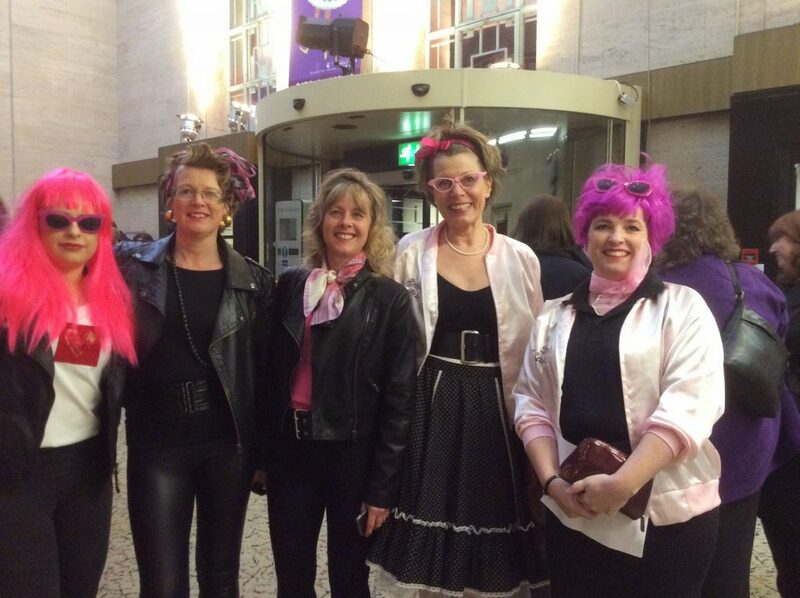 So glad to you all had so much fun being pink ladies. I read this first thing this morning but didn't have time to respond. Having re-read this now I can actually see which one is you. We did the sound of music a few years ago, what a blast. We all got changed at work and were made to walk through the hospital foyer to our cars. It was the beginning of visiting hours and the shocked look on the faces of the visitors was a hoot. Imagine 5 large nuns and a goat hearder packed tightly into a small car going down the A14 to Cambridge in broad day light (the clocks had changed the week before) such memories!! We also saw Joseph and the dreamboat but that wasn't as good. Laughter is medicine for the soul, enjoy it.